Dang, I love my job. Working in radio means cool people come in to talk about cool stuff all of the time. And sometimes they bring GOODIES. Yesterday, Mark and Terri Stark of Willi's Wine Bar came in to talk about their amazing flagship restaurant. Mark and Terri also own 3 other restaurants in Sonoma County: Willi's Seafood and Raw Bar, Monti's Rotisserie and Bar, and Stark's Steakhouse. Their food and service are both phenomenally good at each and every location, but not so expensive that you can't afford to go there a few times a year. I used to go about once a month to one of their places, but I've got to be more budget conscious these days. And so you can imagine how excited I was to see them at the station with goodies to share! They brought Moroccan Lamp Chops (which my coworker refused to share, and I don't blame him) and crab tacos. 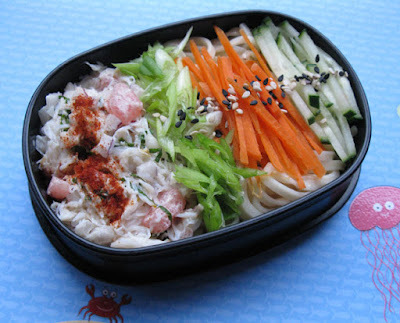 There was enough leftover crab mixture to use it in my bento today. Yesss! I topped the crab filling with a bit of Chimayo Mild Chile Powder from The Savory Spice Shop in Santa Rosa. Also in this compartment: cold soba noodles tossed with olive oil and toasted sesame oil as well as a little splash of seasoned rice vinegar. I topped the cold soba noodles with green onion, julienned carrots, and julienned cucumber. For decoration, I added black and white sesame seeds. In the lower compartment: steamed edamame, cherry tomatoes from Ridgeview Farms, watermelon 'flowers' from Ridgeview Farms, a slice of lime (for the watermelon) and a fish container of soy sauce for the cold soba noodles. 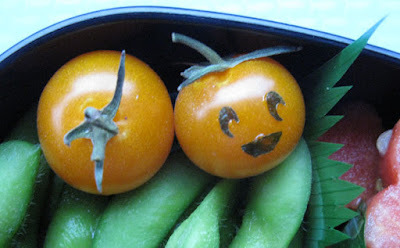 As you can see, I had to decorate one of the orange cherry tomatoes with a little face. He looks kind of like a Jack O'lantern! A Jack O'tomater. Looks absolutely luscious! And the Jack o'tomater so seasonal! Lucky duck, you! Thanks Mokiko! I can't take credit for all of it, professional chefs made the crab mixture. Hi Mrs. P! It's totally worth it. You can find them on Amazon for less than 10 bucks. 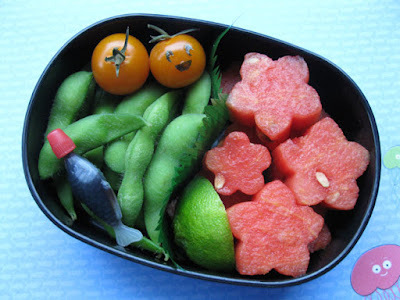 lucky you to have ones brought you goddies LOL..lovely bento! 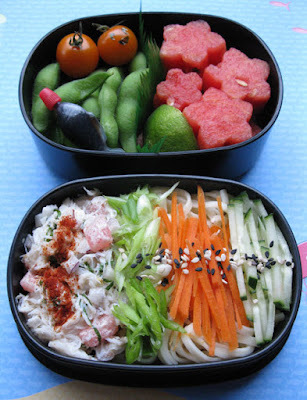 Mmm, this bento looks DELICIOUS! It's so colorful. Thanks Yenny! I am so lucky! Thanks Kari! I really appreciate it! Hi bentobird! The crab and soba worked so well together, super delicious.